The Hepworth Wakefield is home to a rich and eclectic collection of ceramics made by some of the great names of modern pottery, including Hans Coper, Lucy Rie and Albert Wainwright. For this exhibition, British artist Serena Korda will choose a selection of these ceramics to display alongside her own new and existing works, exploring where these objects sit between function and sculpture. Korda has worked with ceramics for several years, often combining her experimental approach to the material with her interest in the acoustic properties of objects. For The Hepworth Wakefield Korda is creating a new work, Resonators, comprising five large, richly glazed vessels with openings at each end. Visitors are invited to interact with the work by placing their ears to each vessel to hear a range of bass-like tones. The exhibition will also feature a new presentation of Korda’s ceramic sound installation Hold Fast, Stand Sure, I Scream a Revolution, which was premiered at Glasgow International Festival of Visual Art in 2016. 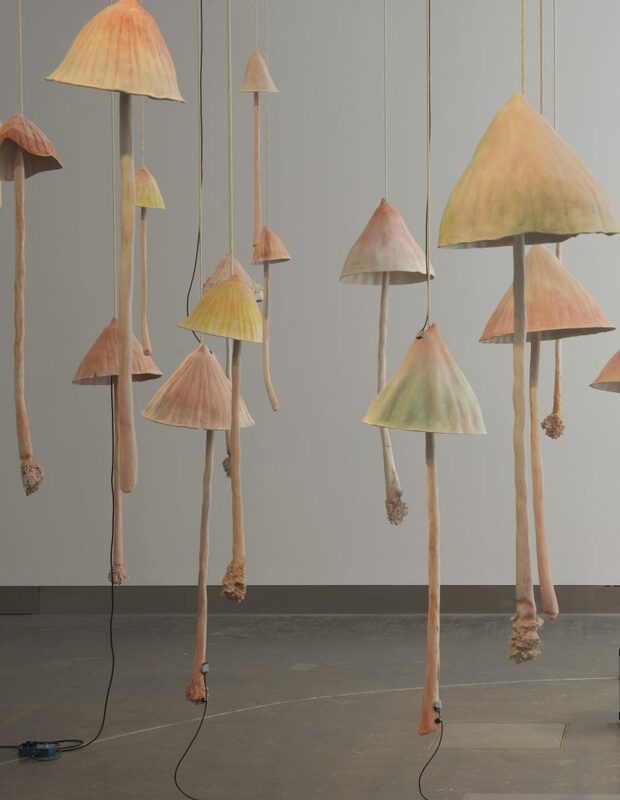 This work is made up of 29 individual porcelain mushrooms suspended from the ceiling, which will be played as bells in public performances during the Ceramics Fair at The Hepworth Wakefield in early May. An essay written for Wakefield Art Gallery in the 1950s referred to clay vessels as ‘daughters of necessity’, highlighting their distinctive status as both functional and decorative objects. As inspiration for the exhibition Korda has looked to Greek mythology, in which the Daughters of Necessity are born of Ananke, the goddess that personifies both necessity and fate. With this in mind, Serena relates the idea of the Daughters of Necessity to the activity of working in ceramics, using alchemical processes that embrace risk and failure. Resonators was developed as part of the Norma Lipman/BALTIC residency at Newcastle University. A solo show of work by Serena Korda will open at BALTIC in February 2018 with themes that relate to the Daughters of Necessity exhibition at The Hepworth Wakefield. Serena Korda, Hold Fast, Stand Sure, I Scream a Revolution, 2016.